It’s nearly Halloween, which means spooky costumes, frightful haunted houses, and candy galore! With all the sweets we’re surrounded by in the office, at school, or at home, it’s hard not to keep going back to the candy dish 5 times a day. Don’t let this holiday totally sabotage your healthy eating. 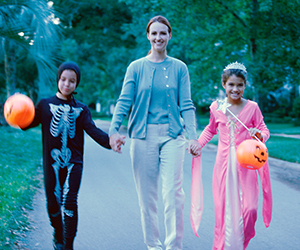 Making smarter choices will keep you and your family happy and healthier this Halloween. Instead of going nuts over packaged candies, cupcakes, and other holiday treats, try a festive update to nutritious foods. Plus, these are perfect for your kids’ class party or your office potluck! We love this festive Pumpkin Veggie Tray. Your kids will gobble up their veggies when they see this fun pumpkin face. Have some chocolate with your fruit with White Chocolate Strawberry Ghosts. They’re silly and spooky and oh so sweet. These Green Apple Monster Mouths are a little bit freaky and a whole lot of yummy! During your trick-or-treating excursions, don’t hop in the car! Take advantage of all the miles you can tread and aim for a 3 mile jaunt through the neighborhood with the family. If you plan to attend a neighborhood harvest festival or trunk-or-treat event, park a little further away than you normally would and walk the rest of the way. After you go trick-or-treating, divvy up the candy your kids get making sure everyone gets a little of everything. If you’re lucky, you can toss extra candy without your kids noticing. If not, stow the candy in an out of the way place so it’s not as accessible.